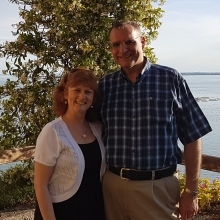 Dan, originally from North Bay, Ontario, Canada and Becky, from Columbia, South Carolina, both grew up in Christian homes. God began to call Dan into cross-cultural ministry through a summer missions trip in 1984. Becky was called as a young child to be a cross-cultural missionary. We met each other on a Teen Missions trip in 1985 and were married in May 1987. Dan graduated from Columbia International University and Becky from Asbury University. Our family first arrived in Italy in February 1998 and we have been in the city of Trieste since 2004. Trieste, a beautiful port city of about 210,000 people, is considered to be a crossroads of cultures due to her rich cultural and political history and her geographical location along the Northeastern border of Italy. From 2004 until 2016, we were involved in ministry to the unchurched as well as helping strengthen and build up a local church. In the summer of 2017 we’ll begin working toward the formation of a new church in the city of Trieste – a church which exists to glorify God though worshiping Him, edifying and building up one another in the body of Christ and through reaching out in witness and service to our city and the world. We are excited about seeing God work to expand His Kingdom further in Trieste. We have two children. Josh is 25 years old, married to Kali. They live in Columbia, SC. Karis is 24 and lives in New York City. We are leading a team to begin a new church in the city of Trieste, Italy, starting in July 2017. Our ministry focuses primarily on evangelism and discipleship as we seek to see God form this new church. We are excited to work with Tyler and Jessica Stewart, who will be arriving, Lord willing, in the summer of 2017. We are also asking the Lord to bring others to join our team. Please pray for a good, strategically-located place we can rent for our church and ministry center. And for God?s work in the lives of those in the area, drawing them to Himself.